Image 1: You may already have read it on the SuppVersity Facebook Wall; "Sacrificing sleep in order to study won't improve your college grades..." it could however easily whack your circadian rhythm and give you headaches. If those turn into a migraine, you may be happy to have read about beneficial effects of magnesium on the incidence of these crippling and painful attacks (see last item in this installment of "On Short Notice" ). In order to avoid having another weekend of "On Short Notice" posts, I decided to post the first collection today, already. The topics are, as usually, only loosely related and I hope that each and everyone of you will find something he or she considers interesting. We'll start out by having a brief look at the amazing antioxidant effects of red onions, and then delve deeper into the connection between obesity and low ferritin levels and a brief reminder that sometimes good things can become bad, if they are not handled properly, next on the list are the tight gut junction opening effects of sodium caprate which may be a good thing if your goal is to increase the bioavailability of berberine, but a very bad thing, if other molecules take the opportunity and pass through the open doors, as we are then going to see Dr. Shirota's probiotics are probably not going to help you avoid this problem and they are certainly not helping patients with metabolic syndrome: The latter is probably also true for PPAR-gamma antagonists, which may help prevent visceral fat accumulation, but could at the same time precipitate to heart disease by decreasing the surprisingly heart-healthy perivascular fat. 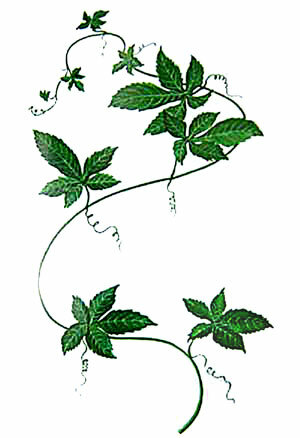 Although more of an ergogenic, Gynostemma penthaphylum (aka Jiagulan) is probably a more promising strategy to get in better shape. If it allows you to train harder, it will also allow you to make better use of potential systemic health effects of exercised induced heat shock protein expression... and just in case all that was so much information that you are having a headache once you have arrived at the end of this blogpost, a 500mg dose of magnesium could help you reduce the incidence of migraine attacks by more than 60% whether additional 500mg of carnitine make this treatment even more effective does yet remain to be elucidated! Do your liver and body antioxidant system a favor and add a couple of red onions to your diet! That's the straight forward take home message from a recently conducted study by a group of Korean scientists (Lee. 2012). The researchers had investigated the effect of red onion on the total activity of antioxidant enzymes in 18-week-old Sprague-Dawley rats. To this ends the rodent had been kept on a diet enriched with red onion peel, flesh or both (all pulverized and mixed into the standard chow for a total content of 5g per 100g) for for weeks. Figure 1: The red onions outperformed easily outperformed their uncolored white brethren and cousin, white onions and garlic, in the in vitro dish and had profound antioxidant boosting effects in the in vivo study (Lee. 2012). The results, (a) a significant increase in plasma SOD activity in the red onion peel and red onion (peel + flesh) groups, (b) a significantly higher GPX (enzyme that recycles glutathione) activity in the in the red onion flesh group and (c) a general tendency towards higher catalase and ORAC activity in the livers and profoundly reduced liver malondialdehyde (=marker of lipid peroxidation) levels in the red onion groups provide an in vivo (allegedly only "in rodent vivo" ;-) confirmation of the in vitro data in figure 1 which is - as usual - to be treated with caution before respective experiments in complex, real organisms confirm that they are more than artifacts of the respective essay. Low iron (ferritin) associated with obesity in adolescents, but simple eating more iron probably won't solve either the iron deficiency, nor the (central) obesity. That's at least what the results of a recent investigation in normal and fat Greek kids would suggest, after all the fat kids did already consume more iron in their diets than their lean age-mates (Moschonis. 2012). What makes this study worth mentioning is the (as usual hasty) conclusion that iron must be a bad guy, when just its mismanagement (probably as a result of adiposity induced liver problems, or, as a handful of older and recent studies would suggest vitamin A deficiency; e.g. Arruda. 2009; Citelli. 2012; Yohsikawa. 2012) is a problem - so don't get fooled, donating blood every other week won't lean healthy people out, it will just drain them out. 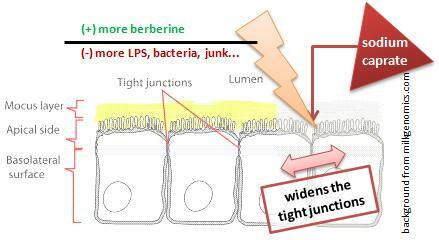 Figure 2: Sodium caprate won't "open" the tight gut junctions for berberine, only, but also for all sorts of other, mostly unwanted junk - self-induced temporary leaky gut so to say! Sodium caprate opens tight junctions of the gut and let's berberine in. The consequence is an amplification of the hypoglycemic effects of berberine (Lv. 2012), but at the same time it is likely to amplify the effects of whatever you else put into your mouth or the critters that live in your stomach are pooping out - I guess it should be obvious that I am referring to the LPS assault from your gut microbiome, here and that the potential increase in lipopolysaccharide could well outweigh (in a negative sense) the benefits you would see from an increased bioavailability (~1.5-2.3 fold; cf. Lv. 2010) of berberine. Against that background I am really not sure how sensible the use of sodium caprate or other "tight junction openers" of natural or pharamacological origin really is. But hey, that's just me - maybe you are less cautious... if there are not yet any products like that on the market, it probably won't be long until the first "enhanced" berberine appear in the line-ups of the large "health supplement" vendors on the Internet. 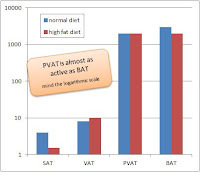 PPAR-gamma ablation leads to loss of perivascular adipose tissue (PVAT). What may at first sound great could in fact be deadly. The recently published results of Chang et al. show quite clearly that non-tissue-specific blockade of the "fat builder" PPAR-gamma (cf. "Tangeritin, Natural Metformin from the Rind of Mandarin Oranges Hits the OFF-Switch on Diet Induced Obesity") is a dangerous undertaking. While keeping the differentiation and growth of body fat at bay, especially in the abdominal region, would be a good thing, the high rate of atherosclerosis among the mice from the laboratories of the University of Michigan confirms that "not all body fat is created evil" (Chang. 2012). And though it is very unlikely that this is going to happen from the use of one of the freely available herbs with anti-PPAR-gamma effects (e.g. tashinones from Salvia miltiorrhiza, or the previously cited tangeritin), it certainly is a good reminder of how fatal our constant black-and-white thinking can be, when it is injudiciously applied to such complex matters as our own body. Gynostemma penthaphylum boosts endurance by ROS scavenging and multiplying skeletal muscle glycogen stores. Not yet another potent anti-oxidant was what I first thought,when I hit upon the soon-to-be published study from Shaanxi Normal University in Xi'an, China, but after taking a closer look it turned out that the way this century old adaptogen that goes by the name jiaogulanin TCM and is an herbaceous vine of the family Cucurbitaceae (cucumber or gourd family) indigenous to the southern reaches of China, northern Vietnam, southern Korea, and Japan, could actually make quite an exciting supplement (Chi. 2012). After all its high ROS(radical oxygen specimen) scavenging abilities are only part of what allowed the rodents in the study by Chi, Tang, Zhang & Zhang that had been treaded with isolated polysaccharides from this plant to go significantly longer during a standardized exercise performance test. The more intruiging part of the performance boost, however came from the direct pro-gluconeogenic and glyocogen storage promoting effects of the alpha variety of the three Gynostemma penhaphylum polyssacharides the scientists had extracted. If similar effects would be seen in humans, GP would certainly make a valuable addition to the regimen of anyone who does not just perform 1-rep maxes day in and day out - and let's face it: In view of the fact that the glycogen can't be synthesized from nothing, it could also help to burn body fat, by it's repartitioning effects. Figure 4: It would certainly be an unwarranted overgeneralization to ascribe all beneficial effects of exercise to the systemic expression of heat shock proteins. But still, there is increasing evidence that their controlled expression does at least contribute to the numerous beneficial effects exercise has on our brains, hearts and other organs; interestingly these effects are likewise mediated by the breakdown and the protection and "recycling" of organ tissue. Will training your biceps, heal your heart and protect your brain!? You probably know that the scientists at the McMaster University have put the myth of the pro-anabolic effects of systemically circulating hormones that are released response to isolated muscle training (eg. "train your legs to increase your testosterone and see your arms grow") at rest, years ago. Now, a study that's soon going to be published in theh Journal of Experimental Biology suggests that testosterone, growth hormone and co. may not be the only molecules we should be looking for, when we talk about possible non-localized effects of exercise (Jammes. 2012). Another class of proteins that has gotten quite some attention esp. in the context of the profound effects of occlusion training, the so-called heat-shock proteins, which are released in response not just to heat, but to exhaustive contractions / trauma / hypoxia / etc., could in fact play a likewise, probably more important role not so much in skeletal muscle growth, maybe, but in the overall systemic response to exhaustive skeletal muscle contractions. After all, Jammes et al. observed a delayed, but significant elevation of non phosphorylated HSP25 and HSP70 in skeletal and respiratory muscles, kidney, and brain. 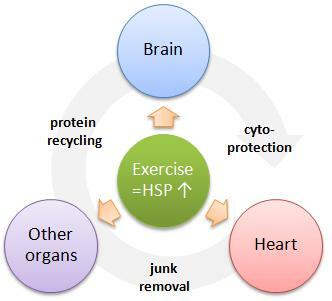 Now, of HSP70, for example, it has long been known that it exerts cardio-protective effects (Martin. 1997). 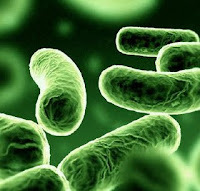 In addition to its anti-apoptotic effects, it does yet also contribute to the proteolysis (=protein breaking) that's a necessary part of the continuous clean-up processes that remove the "junk" and "clutter" (defect protein structures) from your body in order to keep everything functional (Lüders. 2000). Similarly, HSP25 (aka HSPB1) exerts both cytoprotective effects due to its ability to modulate reactive oxygen species and raise glutathione levels, as well as proteolytic effects and is working hand in hand with HSP70 by inhibiting protein aggregation and stabilizing partially denatured proteins, so that they can be refolded by the former. 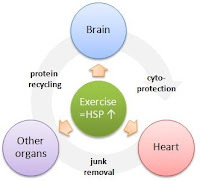 That the latter could be of particular importants in view of the neuroprotective effects of exercise is also supported by a couple of trials in which HSPB1, to be precise, its exogenous administration or endogenous overexpression, have been evaluated as treatment or preventive strategies in ALS (Lou Gehrig's Disease), Huntington's, Parkinson's, Stroke and acute nerve injury (for an overview see table 3 in Brownell. 2012). Headaches? Magnesium and l-carnitin help! At a dosage of 500mg/day magnesium oxide, alone did already have significant beneficial effects on the occurrence of migraine in 106 females and 27 males volunteers who were diagnosed with headache according to the International Headache Society criteria, were between the age of 18 and 55 years old and "had severe and continual headache lasting from 4 to 72 h, unilateral and pulsating headaches with moderate or severe intensity, migraine with or without aura, at least two attacks per month, headaches which were aggravated by routine physical activity and associated with nausea and/or photophobia, and phonophobia" (Tarighat Esfanjani. 2012). So, if that sounds like you (I don't hope it does) magnesium should be the least you should take, the additional 500 mg/day L-carnitine is questionable - just as whether ALCAR may have provided greater benefits. Apropos, you do realize that this is neither transdermal nor any fancy chelated magnesium or at least magnesium citrate that did the trick? Yeah, right: The same "worthless" (put name of random nutrition guru, here) mg-oxide you find in the cheapest fizzy tablet from the supermarket did the trick! Brownell SE, Becker RA, Steinman L. The protective and therapeutic function of small heat shock proteins in neurological diseases. Front Immunol. 2012;3:74. Epub 2012 May 1. Chang L, Villacorta L, Li R, Hamblin M, Xu W, Dou C, Zhang J, Wu J, Zeng R, Chen YE. Loss of Perivascular Adipose Tissue upon PPARγ Deletion in Smooth Muscle Cells Impairs Intravascular Thermoregulation and Enhances Atherosclerosis. Circulation. 2012 Aug 1. Chi A, Tang L, Zhang J, Zhang K. Chemical Composition of three Ingredients of Polysaccharides from Gynostemma pentaphyllum and Comparison of their Antioxidant Activity in Skeletal Muscle of Exhaustive Exercise Mice. Int J Sport Nutr Exerc Metab. 2012 Aug 14. Citelli M, Bittencourt LL, da Silva SV, Pierucci AP, Pedrosa C. Vitamin A Modulates the Expression of Genes Involved in Iron Bioavailability. Biol Trace Elem Res. 2012 Apr 14. Fitzgibbons TP, Kogan S, Aouadi M, Hendricks GM, Straubhaar J, Czech MP. Similarity of mouse perivascular and brown adipose tissues and their resistance to diet-induced inflammation. Am J Physiol Heart Circ Physiol. 2011 Oct;301(4):H1425-37. Jammes Y, Steinberg JG, By Y, Brerro-Saby C, Condo J, Olivier M, Guieu R, Delliaux S. Fatiguing stimulation of one skeletal muscle triggers heat shock proteins activation in several rat organs: the role of muscle innervation. J Exp Biol. 2012 Aug 16. Leber B, Tripolt NJ, Blattl D, Eder M, Wascher TC, Pieber TR, Stauber R, Sourij H, Oettl K, Stadlbauer V. The influence of probiotic supplementation on gut permeability in patients with metabolic syndrome: an open label, randomized pilot study. Eur J Clin Nutr. 2012 Aug 8. Lee B, Jung JH, Kim HS. Assessment of red onion on antioxidant activity in rat. Food and Chemical Toxicology. August 10, 2012. Lüders J, Demand J, Höhfeld J. The ubiquitin-related BAG-1 provides a link between the molecular chaperones Hsc70/Hsp70 and the proteasome. J Biol Chem. 2000 Feb 18;275(7):4613-7. Lv, X.Y., Li, J., Zhang, M., Wang, C.M., Fan, Z., Wang, C.Y., Chen, L., 2010. Enhancement of sodium caprate on intestine absorption and antidiabetic action of berberine. AAPS.PharmSciTech. 11, 372–382. Martin JL, Mestril R, Hilal-Dandan R, Brunton LL, Dillmann WH. Small heat shock proteins and protection against ischemic injury in cardiac myocytes. Circulation. 1997 Dec 16;96(12):4343-8. Moschonis G, Chrousos GP, Lionis C, Mougios V, Manios Y. Association of total body and visceral fat mass with iron deficiency in preadolescents: the Healthy Growth Study. Br J Nutr. 2011 Nov 16:1-10. Ruan CH, Dixon RA, Willerson JT, Ruan KH. Prostacyclin therapy for pulmonary arterial hypertension. Tex Heart Inst J. 2010;37(4):391-9. Tarighat Esfanjani A, Mahdavi R, Ebrahimi Mameghani M, Talebi M, Nikniaz Z, Safaiyan A. 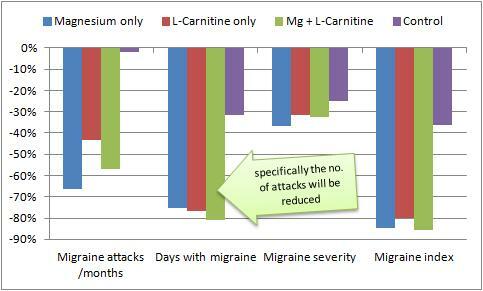 The Effects of Magnesium, L-: Carnitine, and Concurrent Magnesium-L-: Carnitine Supplementation in Migraine Prophylaxis. Biol Trace Elem Res. 2012 Aug 17. Yoshikava O, Ebata Y, Tsuchiya H, et al. A retinoic acid receptor agonist tamibarotene suppresses iron accumulation in the liver. Obesity. 2012 Aug.